The JTC BioMed Hub @ Tuas Biomedical Park is one of the suite of next-generation industrial facilities by JTC. 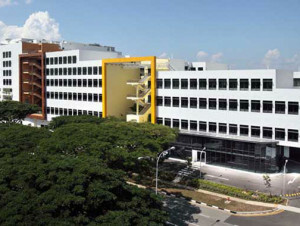 It is a world-class manufacturing hub for the biomedical industry in Singapore. The hub was developed to support the needs of biomedical players in the Tuas Biomedical Park (TBP), and catalyse the growth and transformation of the biomedical industry. Targeted to house key biomedical suppliers and vendors, the JTC BioMed Hub provides a range of sup- porting services to the biomedical cluster at TBP. At the same time, with the clustering of biomedical players at a single location, the hub is intended to create opportunities for information sharing and collaboration across the value-chain. Open to SMEs, the hub will also enable SMEs the opportunity to be part of a larger industry ecosystem, enhancing the competitiveness of not only individual companies but the entire value-chain. Situated at the heart of JTC’s TBP, the hub is set to revitalise the surrounding Tuas area and provide a conducive work environment for the working community there. This includes a range of amenities such as meeting and training room spaces, a gym, food court, drive-through restaurant, clinic and a child care centre that are not only open to tenants at the hub but the broader working community in the area. the highest in Tuas to-date. In enhancing construction productivity, precast systems for staircases and external wall facades were utilised, as well as system formwork, to reduce labour requirements and increase construction productivity. In enhancing environment sustainability, the development has been carefully designed, leveraging on passive design strategies to maximise natural lighting and ventilation, so as to reduce dependence on energy consumption while making the building ‘breathable’ for its users. Greenery, for example, has been introduced at various areas of the development to promote natural cooling and ventilation. In keeping the building cool, windows in the building have also been strategically located to reduce the Sun’s glare and external heat while still bringing in light. 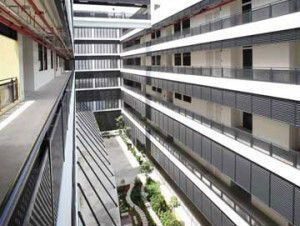 To facilitate natural ventilation, fixed louvers were installed below the casement windows to direct external wind upwards into units. Perforated aluminium panels were also installed at strategic angles at railings to allow wind to pass through while keeping rain out from the corridors at the same time. The development has also been designed with a central courtyard to create a void to bring in wind into the industrial units; promoting natural circulation and ventilation. As a result, natural ventilation is sufficient for most parts of the building, reducing the need for air-conditioning except in commercial areas. This in turn minimises energy wastage while maintaining user comfort. These design features not only help to reduce energy consumption and enhance sustainability, but also help tenants to reduce fittings and operating costs.